Kristen, along with her husband Capt. David Salazar, are owners of Casa Vieja Lodge a 19-bedroom hotel and with 10-classic charter boat fleet on the Pacific Coast of Guatemala. Casa Vieja Lodge delivers luxurious turn-key fishing packages while concentrating on the 5-Star Angling Experience. Casa Vieja Lodge practices responsible conservation techniques so that future anglers can have an experience as special as those of today. Studies show that a billfish caught and released can generate 10 times or more in tourism-related revenue than the revenue generated by a billfish caught and killed by a commercial fishing operation. Sustainability and conservation are at the forefront of the business. Recently, Casa Vieja Lodge committed to Kick Plastic by eliminating all single-use plastic bottles both at the lodge and aboard the fleet, preventing 80,000 plastic bottles from entering the environment they rely so heavily on. 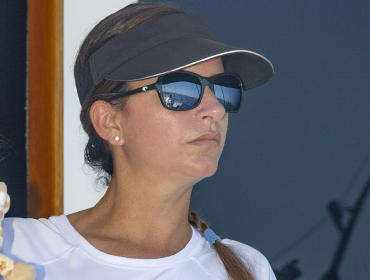 Although Kristen grew up in Hawaii, David introduced her into the sportfishing world 12 years ago. Throughout this time, she battled with vertigo, found the best solution, and now is extremely proud to be teaching her two young daughters all about fishing! On a day off, you can find the Salazars being extremely competitive and fishing on the bountiful, sailfish rich, Guatemalan waters reeling in sailfish after sailfish, always looking for a marlin!